KILIFI, Kenya – Purity Bahati was only 15 when she started dating her boyfriend, a 28-year-old man. “He told me he loved me, and I believed him,” she said. She was pregnant by the time she was 17. The pregnancy forced her to drop out of the public school she attended in Kenya’s Kilifi County. “My parents were so furious with me, and they kicked me out of their home,” she said. Today, Purity is 19 and the mother of two. She spends her days caring for her children while her husband works as a casual labourer. Around the world, teenage pregnancy robs girls of their childhoods, their educations and their futures. These pregnancies tend to be the result of having few choices in life. The girls affected often lack access to sexual and reproductive health information. Pregnancy only exacerbates their vulnerability to poverty, exclusion and exploitation. It can also take a dangerous toll on their health – complications from pregnancy are a leading cause of death among adolescent girls. Yet it is all too common. Every day in developing countries, an estimated 20,000 girls younger than 18 give birth. 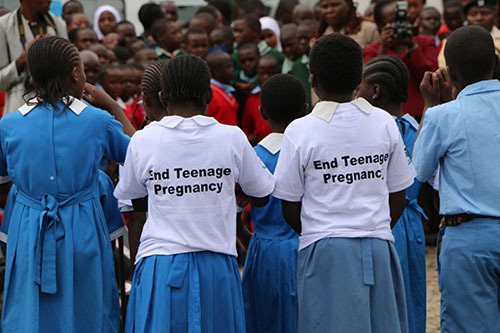 In Kenya, nearly one in five girls aged 15-19 have already had a baby or are pregnant, according to a 2014 survey. UNFPA is working with the government and the International Centre for Reproductive Health (ICRH) to reduce these underage pregnancies and keep girls in school. They are engaging the community at all levels, including schools and youth themselves. They are also supporting public forums that raise awareness about sexual and reproductive health, gender equality, girls’ rights and the importance of education. Community outreach campaigns and peer education programmes are also helping to spread these messages. About 50 yards away from Purity’s hut is the home of 18-year-old Naomi Kitsao. She is also a married mother of two. In fact, she and Purity were best friends in school. Under peer pressure, Naomi became sexually active when she was 14 years old. “It was fun and cool to have boys dying to have you. It made one feel wanted, loved and appreciated,” she said, explaining that many teenagers believed it was impossible to get pregnant or contract HIV at their age. By the time she was expecting her second child, she was attending a tailoring college, but had to drop out for lack of money. Now, like Purity, she is unemployed, as is her husband. But neither she nor Purity have lost hope. Both young women were reached through a door-to-door community outreach effort, and have received training about their reproductive health and rights through the UNFPA-supported peer education programme. The two have emerged as powerful advocates for change, teaching other young people how to prevent sexually transmitted infections and that contraceptives can help them determine whether and when to get pregnant. They hope this information will help others finish their educations, even if they were not able to themselves.